I got the email, did you? J.Crew has restocked their (digital) shelves with pretty new arrivals. While I would take anything from their current offerings, these are the items that are making me drool the most! What is currently filling up your imaginary shopping carts? ALL of these things! though i just found a similar heart sweater on forever21.com for a mere $17! oh the whoas of being on a budget. LOVE that heart sweater :) My imaginary cart is quite full these days, especially since I will have no shopping budget for August! Oh, that chevron print sweater is so pretty! I saw the email too & have been drooling over that chevron dress. Fabulous! I was gonna mention the F21 heart sweater too. Someone I follow recently posted a link to all of the cheapy versions of J.Crew stuff. Let me see if I can find it.......FAIL! I can't find it. Boo on me! I'll let you know if I come across it. Those are all good picks --my fave of yours is the blazer for that 2 piece suit. It's gorgeous & it seems like it would be a very versatile piece! Love these, I wonder if this means more sale stuff online as well??? 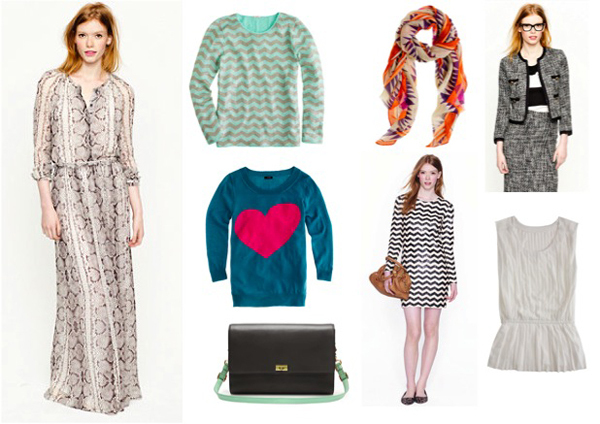 Love all of these, especially the tribal print scarf! ah I wish we had a J Crew over here! the heart jumper is really adorable. oh jcrew...you've done it again! all of these are just too perfect! especially coveting that chevron top! Oh my gosh I just got a J.Crew catalog...WANT. All of it! I absolutely love that heart sweater, they also had SO many adorable polka dot things (including sweaters). I'm also loving the many colors/types of flats they have and all the gorgeous button-up prints. Basically, I'm dying for fall and fall fashion! Can't wait!! Absolutely LOVE J.Crew!!! So excited all my sweaters (I love mint too!) will still be in style!